There was a time, not that long ago, when every second Australian biography appeared to be either about a current player or Bradman. The reason for publishing decisions is clear – money. Books about old cricketers simply do not sell as many copies as the ghosted musings of a modern player; no matter what lengths the said modern might go to to avoid controversy. Thankfully in recent times there has been a deluge of biographies of past heroes, which pull no punches, backed by publishers who are prepared to accept a lower return on their investment. The best of these are penned by quality writers. Thankfully Billy Murdoch was in the safe hands of experienced cricket authors Richard Cashman (‘Demon’ Spofforth) and Ric Sissons (‘Reggie’ Duff), both writers who know what makes a quality read. Billy Murdoch starts at the end, with Murdoch’s death during the second Test at the MCG between South Africa and Australia in 1911. He suffered a stroke during the luncheon interval at the age of 56. It is hard to imagine a more fitting end for a former Australian Test captain, and to my knowledge Murdoch is the only one to die at a Test match. The story of Murdoch, who for many years was the best batsmen in Australia and second to only W.G. Grace in the world, will not be known to the majority of cricket fans. Murdoch was there from the start of Australia’s tours to England and later played a Test for England against South Africa. Some of the cricketing stories and events, viewed through modern eyes, look either amateurish or simply unbelievable. An example is Murdoch, the Australian captain, fielding as substitute for W.G. Grace in a Test match and taking a catch to remove an Aussie team mate. Cashman and Sissons expertly weave the fledging international cricket events into the life and times of Murdoch. Forget sandpapergate or Chappell’s underarm delivery, Murdoch was involved in some ground breaking cricketing moments and controversies. He was the captain in the 1882 Test that gave rise to the birth of the Ashes. He was also captain when almost the entire Australian team refused to play a home Test series because they were dissatisfied with their share of the gate. So controversial and so savage was the negative press aimed at Murdoch after the home Test boycott that he did not play First Class cricket for five years. The authors of Billy Murdoch, contend that his missing those five years when in his prime may have cost him a greater status in the history of Australian cricket. The authors suggest this is a contributing reason why there are no grandstands named after Murdoch at the SCG, where he was the first player to score a triple century. Murdoch has also been overlooked for inclusion in the Australian Cricket Hall of Fame and many other sporting honour lists. Apart from cricket, the authors have done sterling work on the personal life of Murdoch and like his cricket it is a rollercoaster ride of controversy. From his father leaving the family when Billy was 13 years old, serving a prison term and fleeing to the USA and remarrying, to Murdoch having to declare bankruptcy after a poor investment, and eloping with a millionaires’ daughter, the surprises never stop. The authors have done a superb job and have produced a thought provoking biography of a forgotten great of Australian cricket. 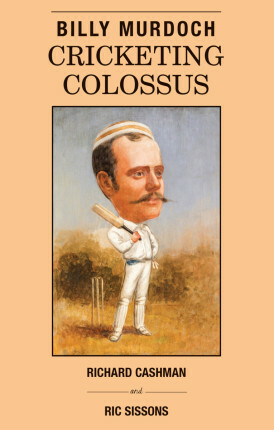 After you read this book you too will wonder why Billy Murdoch is not at least in the Australian cricket hall of fame. Billy Murdoch is highly recommended.